The purpose of this document is to teach you how to make different types of harmonograph images using the Virtual Harmonograph application on WorldTreeSoftware.com. The lessons learned here can also be applicable to real physical harmonographs. If you have any questions or comments contact me here. You don’t need to be an expert in mathematics to work with harmonographs. As long as you understand ratios and basic mathematics you should be good. Also, you don’t need to know trigonometry, but it would certainly help to understand trigonometric values and their equivalent angles. For example, π (PI) radians is 180 degrees, π/2 is 90 degrees, etc. Likewise, you don’t need to know about music theory, but it may help to understand certain aspects of harmonics as they pertain to frequency ratios. There is an intrinsic link between musical tones and harmonographs. Ratios that correspond to pleasant sounds make for pleasant looking harmonographs. But in no way is this a requirement. 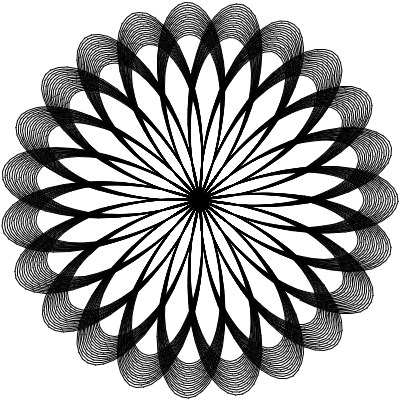 A harmonograph is a mechanical apparatus that employs pendulums to create a geometric image. These images are produced by a machine with a number of pendulums connected to a pen and/or the surface the pen is drawing on. 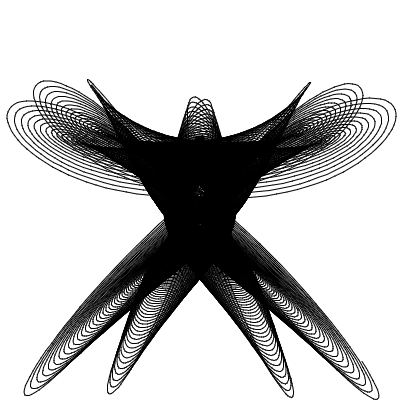 You can produce interesting images by moving these pendulums at different amplitudes, frequencies and phases. The thing that makes harmonographs interesting is that they have a direct relationship to music. Harmonic ratios that produce beautiful sounds also produce beautiful harmonograms. Before we get into learning how to use harmonographs let's take a look at all of the parameters for a pendulum. 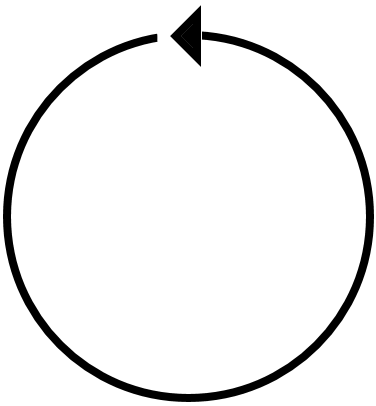 A note about the phase: When you have two pendulums that are in phase it is referred to as a closed phase. 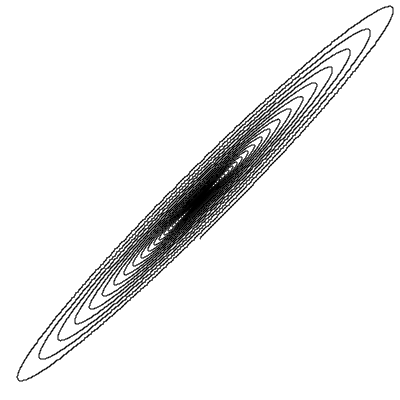 This generally doesn't produce very interesting curves. When the phases differ it is called an open phase. On a real physical harmonograph you would differ the phases by releasing one pendulum and then releasing the other after the first reached a particular position. In the Virtual Harmonograph app you can set the phase offset. A phase value of π/2, or 90 degrees, is equivalent to releasing the second pendulum when the pendulums are at right angles to each other. These lessons proceed from the most basic to more advanced topics, so it’s best to visit them in order. Each image can be clicked on to open Virtual Harmonograph with the particular settings of that graph. I encourage you to play around with these settings to learn what effect it has on the images produced. The first lesson focuses on lateral harmonographs, which is the most basic harmonograph. 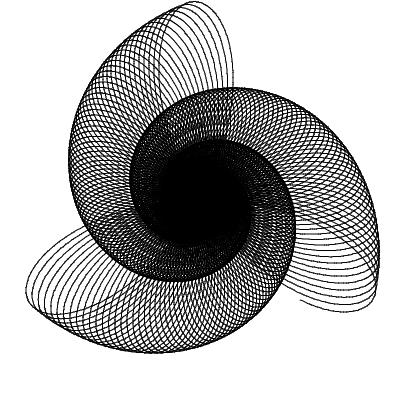 Lesson two focuses on rotary harmonographs which employ multiple pendulums to create more interesting curves. 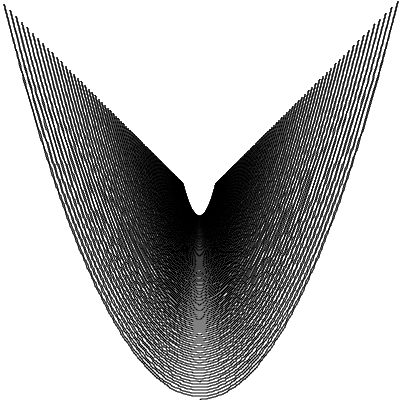 A lateral harmonograph is a simple harmonograph that uses two independent pendulums. One controls the pen’s movement on the x-axis and one on the y-axis. By varying the frequency and phase of the pendulums relative to one another, different patterns can be created. 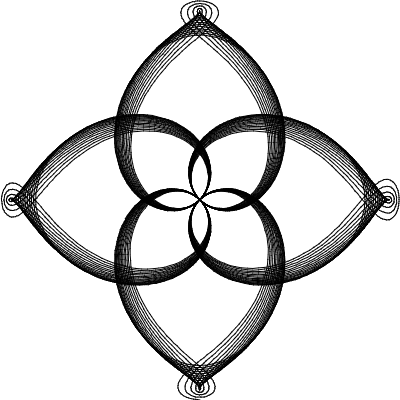 These patterns are called Lissajous figures. 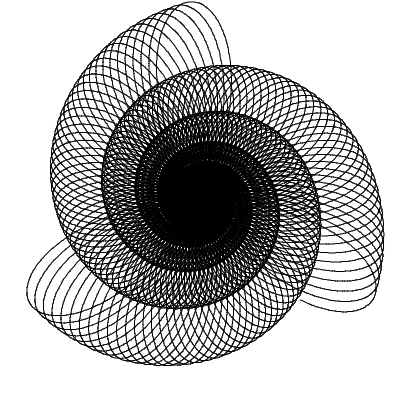 The simplest of the Lissajous figures uses a frequency ratio of 1:1. 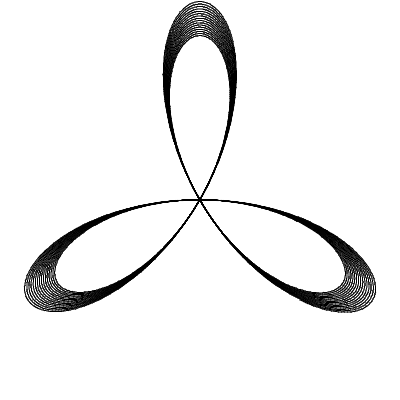 It is called unison because both pendulums have the same frequency and amplitude. That is, the frequency of both the x and y pendulums are set to the same value. For those of you familiar with music theory this is known as the tonic. If we set equal frequencies without offsetting the phase of one of the pendulums it results in a straight diagonal line. This is called the closed phase. To get something a little more interesting we need to shift the phase of one of the pendulums to get an open phase. 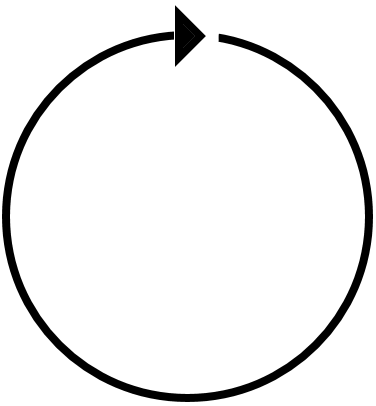 In the open phase the graph will be that of a spiral. 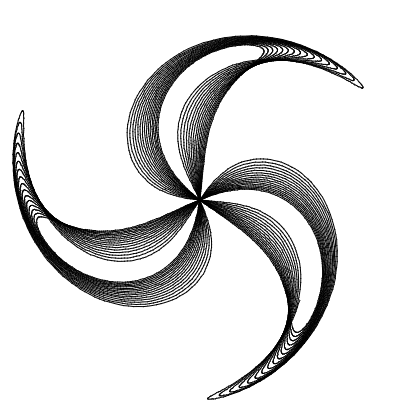 To create a perfect spiral we offset the phase of one of the pendulums by π/2 (1.570796) which is 90 degrees. This is equivalent to having one pendulum start at the top of its arc while the other is at the bottom (at right angles to each other). The pendulum that you shift determines which direction the spiral will take. 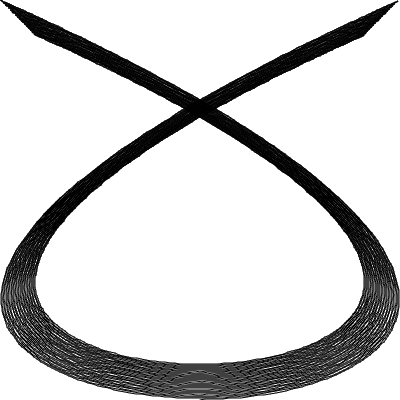 If the x pendulum’s phase is shifted it rotates clockwise. If the y pendulum’s phase is shifted it rotates counterclockwise (This is an important concept that we will need to remember later on in lesson two). 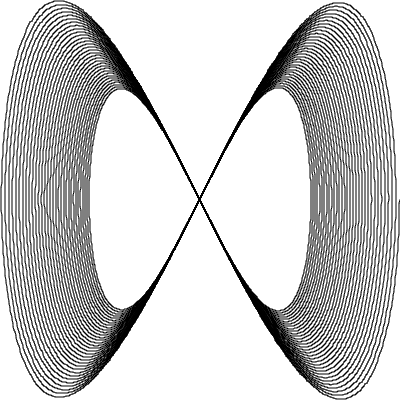 By adjusting the phase to any value between 0 and π (3.14156) we can produce spirals that are elliptical in shape. As an exercise try changing the amplitude of one of the pendulums. What effect does it have on the shape of the graph? Now try changing both the phase and amplitude (But not the frequency just yet; we’ll explore other frequencies in the following exercises). The next ratio we will discuss is 2:1, also known as the octave in music theory terms. 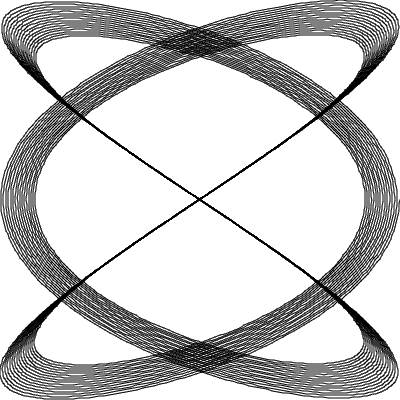 It produces a Lissajous figure that looks like a figure eight in open phase and a U or wing shape in the closed phase. Let’s build upon the harmonograph we defined in exercise 1. Change the y axis pendulum’s frequency to 2. Now if we set the phase of both pendulums to 0 (closed phase) it will draw a U shape. If we offset one pendulum by π/2 (open phase) it will draw a figure eight. As an exercise change the x axis pendulum’s frequency to two. What happens to the shape? The next ratio is 3:2, also known as the fifth in musical terms. In music theory the fifth is an important note. It is the strongest tone next to the tonic, or root. 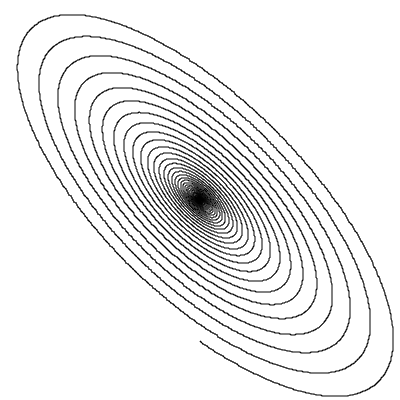 In the open phase the figures produced by this ratio have three loops in one direction and two in the other. In the closed phase it looks like a fish or ribbon. As an exercise swap the ratios around so that the x pendulum is 2 and the y pendulum is 3. Also try swapping the phase. What happens to the drawing? Here is a list of all the harmonic ratios4. I encourage you to try some or all of them, both open and closed phase, to see what results you get. Do you notice any patterns? 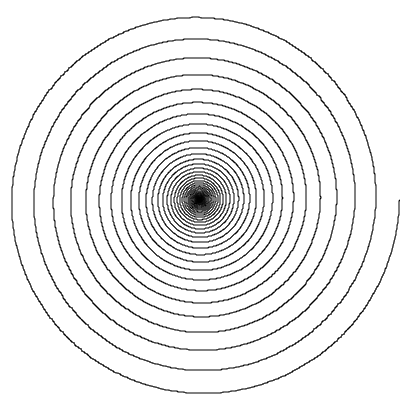 A rotary harmonograph is created by taking a lateral harmonograph and adding another set of pendulums. On a real, physical harmonograph this is usually accomplished with a gimbal, which is a pivoted joint that can move around a single axis. The drawing surface is attached to the gimbal which allows it to move around in a circle under the pen. 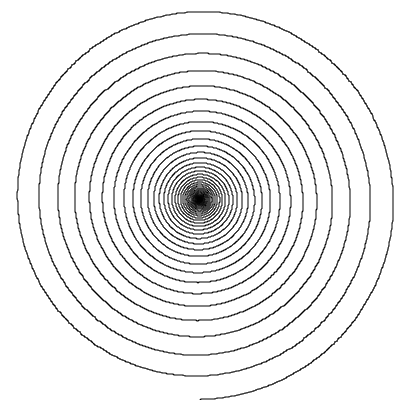 A rotary harmonograph can produce more interesting images than a lateral harmonograph. A number of different results can be achieved by varying the phase and frequencies of the sets of pendulums. We can produce interesting looping and flower shaped figures. When talking about rotary harmonographs we refer to the movements in terms of sets of pendulums rather than individual pendulums. Also, instead of open and closed phase we talk of the sets of pendulums as concurrent and countercurrent (or contrary). Concurrent means that both sets of pendulums are moving in circles in the same direction (similar to closed phase in lateral harmonographs), while countercurrent means that they are moving in opposite directions (similar to open phase). As you will see, concurrent motion produce images with inner loops while countercurrent produce images with outer loops. 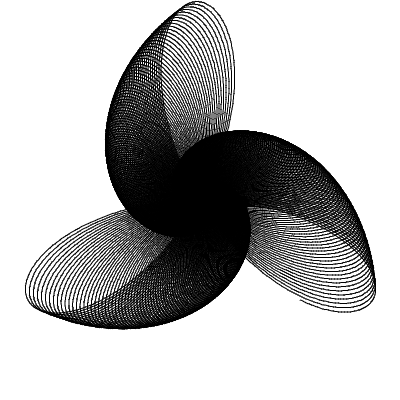 To simulate a rotary harmonograph in Virtual Harmonograph we create two sets x and y axis pendulums and configure them to produce spirals (see lesson 1, exercise 1). When they have the same phase (i.e. 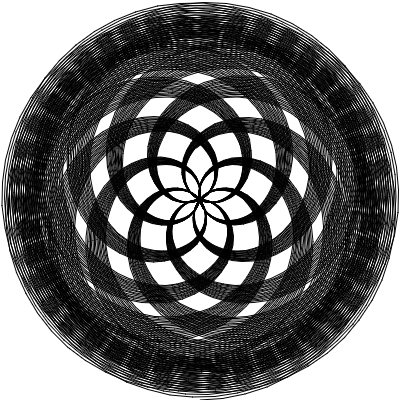 they are spinning in the same direction) then they are concurrent. In this case the two sets of pendulums effectively cancel each other out producing an image that is a point at the center of the graph. 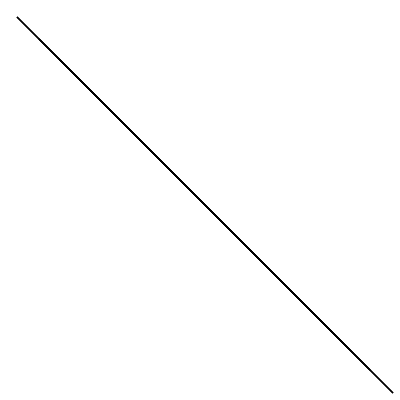 If we make them countercurrent by changing the direction of one of pendulums, then it will produce an image that just a single line, like what happens for lateral unison in the closed phase. If you remember from that lesson we can changed the direction of a spiral by changing the phase of either the x or y pendulum to π/2 (1.570796). 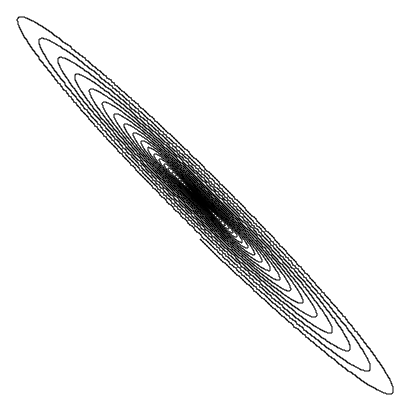 Next we’ll create a rotary octave harmonograph with a 2:1 ratio. To do this we simply start with a rotary unison harmonograph and change one set of pendulums to have a frequency of 2 while the other set remains 1. What this means is that one set of pendulums is moving in circles twice as fast as the other. When both set of pendulums are moving in the same direction, i.e concurrent, we get a spiral with a smaller loop on one side. 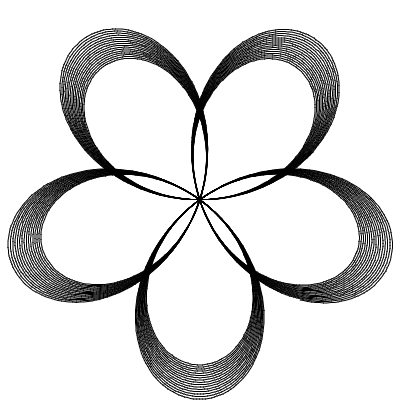 When countercurrent we get a three looped image that looks like a flower, in this case a trillium. 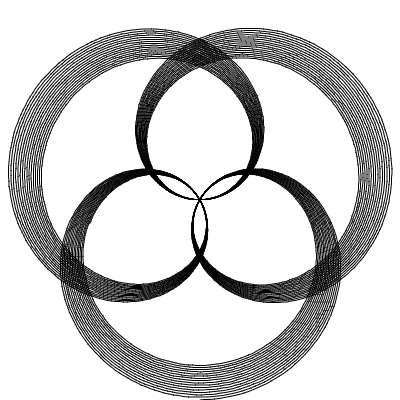 The rotary fifth with a ratio of 3:2 produces images very similar to the octave only with more loops in them. Starting with the harmonographs from exercise two change one set of pendulums to have a frequency of 3 and the other set to have a frequency of 2. Now one set of pendulums is moving three revolutions in the same time that it takes the other to move two. 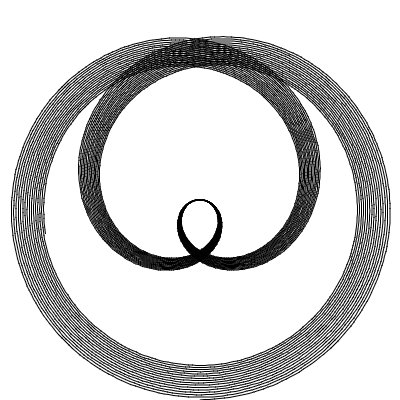 When concurrent we get an image very similar to the octave except the inner loop is embedded in another loop. 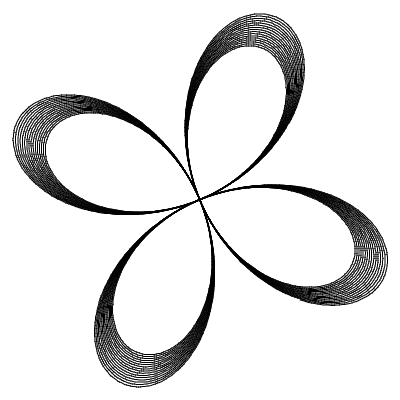 When contrary we get a flower with five petals. 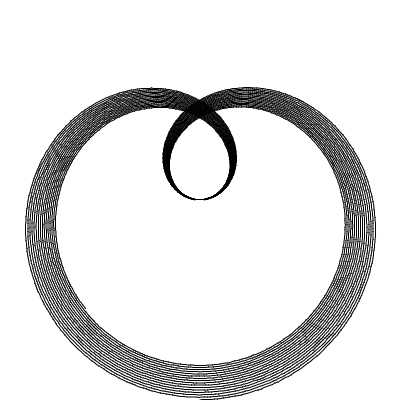 When concurrent the number of inner loops is the larger number minus the smaller. When contrary the number of outer loops are the numbers added together. So for concurrent 2:1 the number of inner loops is 2-1=1. For contrary 2:1 the number of outer loops is 2+1=3. For concurrent harmonic ratios this ranges from one to seven, and contrary from three to 31. Here is a ratio of 15:8 which is major seventh. 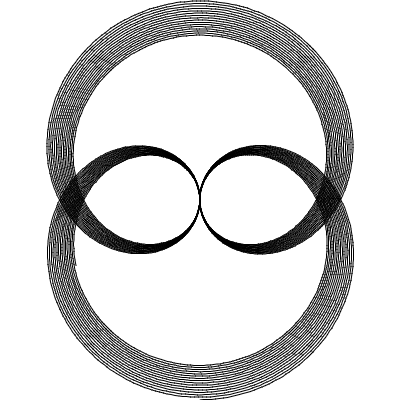 The concurrent one has seven (15-8) inner loops and looks like a dream catcher. The contrary one has 23 (15+8) outer loops. As an exercise see what happens when you use multiples of the harmonic ratios. For example, double the octave ratio from 2:1 to 4:2. What happens to the image? An overtone is any frequency higher that the fundamental frequency of a sound2. Overtone ratios are always defined as n:1. For example 1:1, 2:1, 3:1, 4:1, etc. Notice that the unison and octave ratios are also overtones. The ratio 2:1 is also known as the first overtone, 3:1 the second overtone, etc1. Graphing the overtone ratios produces images similar to the harmonic ratios except that the loops are a little more open. Here are images of the concurrent overtone ratios 3:1, 4:1 and 5:1. Here are images of the contrary overtone ratios 3:1, 4:1 and 5:1. Take a look at the centers of these flowers. 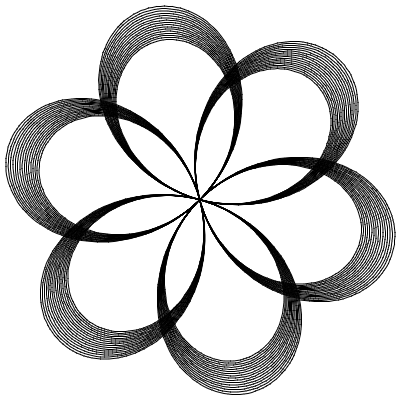 They contain images very similar to the flowers created by contrary graphs of harmonic ratios. 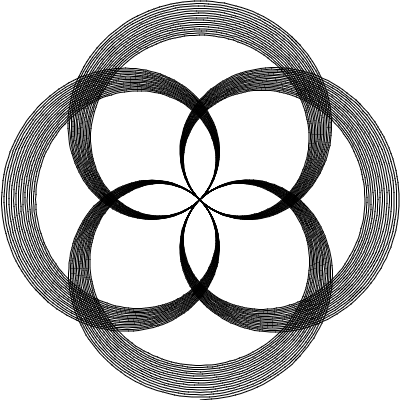 The overtone ratio of 4:1 creates an inner flower similar to the harmonic ratio of 3:2 and their ratio numbers add up to 5. As an exercise keep increasing the ratio to 6:1, 7:1, even 20:1. What happens? Do the patterns start to repeat or just get more intricate? 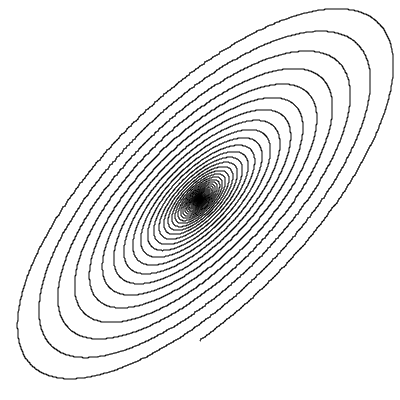 All of your ratios don't need to be harmonic to produce nice looking harmonographs. You can produce some very interesting images by using ratios that are close to harmonic ratios, or even just compeltely random ratios. Sometimes ratios will be so dicordant that the image looks like a mess. But you can find some very interesting images by going rogue with random ratios. First let's look at some near misses. These are harmonic ratios where you slightly vary the numbers. These images are of a rotary contrary 2:1 octave ratio where the ratio has been changed to 2.01:1, 2.02:1 and 2.04:1. They start out looking like fans then change to slinkys. As an exercise see what happens if you keep incrementing the first number of the ratio. How does the image change? Does it start to get more discordant or stay harmonious? Now let's try a few random ratios. In virtual harmonograph there is a "Randomize All" button in the pendulum settings. This randomizes everything on each pendulum including the amplitude, frequency, decay and phase. When using this button you may have to adjust the scale of the drawing in the settings view to make it fit. You can also adjust the amplitudes back to 1 to make the image smaller. Here are a few interesting images. That last one looks pretty menacing, like some kind of insect villain. As an exercise play around with some random ratios of your own to see what you can find. All pseudo-pendulums have frequency, decay and phase just like real pendulums. The surface rotation pseudo-pendulum smoothly rotates the drawing surface back and forth clockwise and counterclockwise starting at a specified angle. Think of a swing that you wind up and let go. It will unwind, then wind up again, then unwind, back and forth until it runs out of energy. Don't confuse it with a rotary harmonograph, they are two very different things. The rotation amount is any positive number where 0 is no rotation, π/2 is 90 degrees, π is 180 degrees etc. The following are rotary harmonographs that have had a rotation applied. If you look closely at the settings of the first two you'll notice that the rotation amount is set to the first number plus the second number of the ratio of the two sets of pendulums. In the octave example the ration is 2:1, so the rotation amount is set to 3. 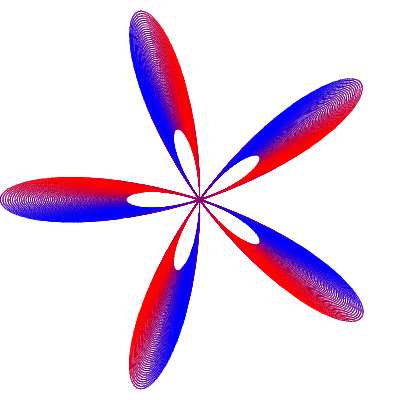 This seems to produce a pinwheel effect on rotary harmonographs with harmonic ratios and contrary motion. Other rotation amounts will produce less harmonic images. The last image is a rotary harmonographs with an overtone ratio of 5:1 and contrary motion. Overtone ratios seem to prefer a rotation amount of the first number minus the second. So in this case the ratio is 5:1 and the rotation amount is 4. 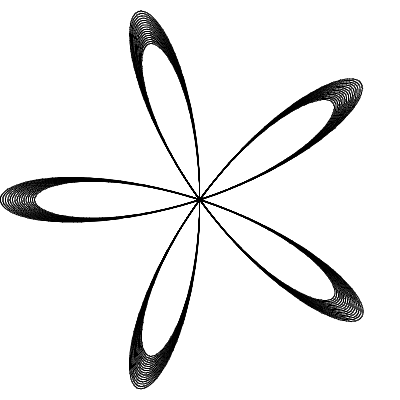 As an exercise try to determine what rotation amounts work best with other types of harmonograph configurations. 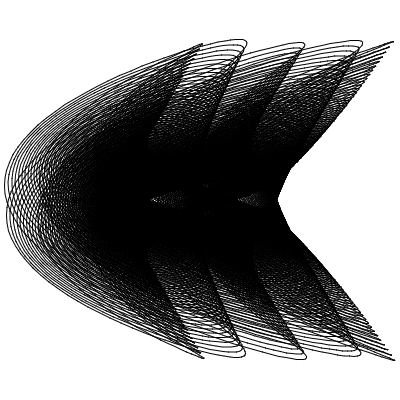 There are three pen pseudo-pendulums that can be used to give your harmonograph images a splash of color and effect. You can vary the pen color between two different colors. The color will keep fading back and forth between the two colors. The pen opacity can vary between two different opacities anywhere between 0 (completely transparent) and 1 (completely opaque). The pen width can vary between any two positive real numbers. 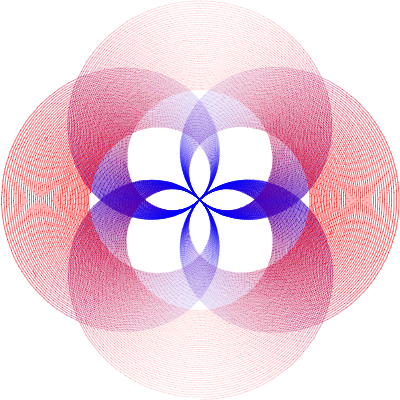 The first is a fifth contrary rotary harmonograph with the pen color varying between red and blue. Like the surface rotation pseudo-pendulum if you set its frequency to the ratio number added together the colors will follow the loops. The second is a 5:1 overtone with the pen opacity varying between 0.1 and 0.6. This one has the frequency set to 6 which is the sum of the two number of the ratio. 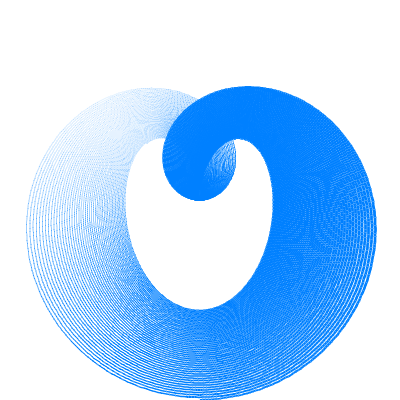 This seems to make opposite loops have identical opacity. The final image is an 2:1 concurrent configuration with pen width varying between 0.1 and 3. It has a frequency of 1 which gives it a three-dimensional look. 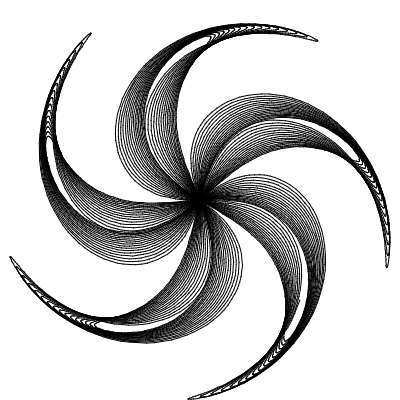 If you find harmonographs interesting and would like to discover more about them, then I suggest you read the book Harmonograph: A Visual Guide to the Mathematics of Music by Anthony Ashton. It was instrumental in helping me figure out how to create the harmonographs in this document. 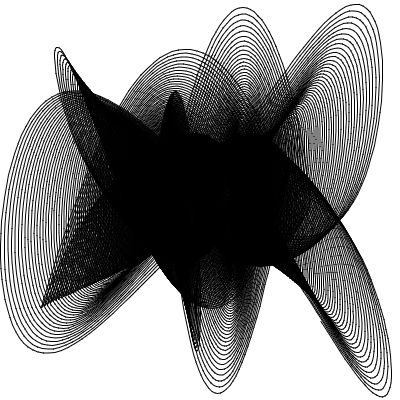 Anthony Ashton, Harmonograph: a visual guide to the mathematics of music. 2003 Walker Publishing.